Tom's Hardware has a piece on a new type of storage. Solid-state drives (SSD) seems the way to go. What I miss from the review is a more subjective opinion on how it affects normal use; Tom's reviews tends to focus only on the numbers. All aspects except random write seems better with SSD. More about the disks at SanDisk. Their whitepapers are not fantastic reading (just a bit biased you could say), but still something with more detail. 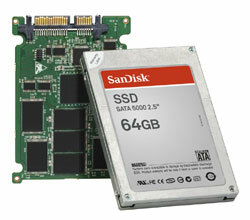 Tom says a SSD with 32 GB will cost about $400 at the moment. Content updated 10 March 2019. <URL: http://boralv.se/blog/?id=1192435444>.